CryENGINE is the popular and insanely powerful game engine used in games such as Crysis, Ryse, and originated with Far Cry 1. Developed by Crytek, it supports the latest and greatest visual renderers such as DX11. CryENGINE 4 is coming soon as well as Linux support. A modified version of the CryENGINE spawned the Dunia Engine, which is used by Ubisoft Montreal for Fary Cry 2 and 3. 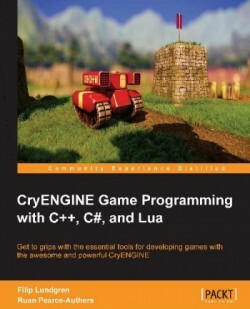 I wanted to try my hand at playing around with the famous engine and thus I am reviewing CryENGINE GameProgramming with C++, C#, and Lua by Filip Lundgren and Ruan Pearce-Authers, published by Packt Publishing. Read on to see how it went. This entry was posted in Review and tagged book, C++, cpp, cryEngine, lua, programming, review on March 16, 2014 by Anthony Barranco.